Bitumen filter - GlobeCore Bitumen Emulsion. FBS-1 bitumen filter is designed to remove solid contaminants from bitumen and other non-corrosive liquids. 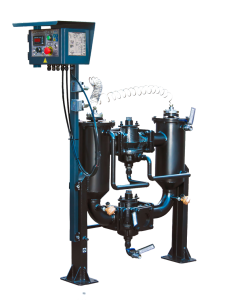 The filter is intended for integration into input, storage and output processes involving regular or modified bitumen, bitumen emulsions and other high viscosity liquids which require heating. This filter has two filter cartridges so as to operate continuously. It also features temperature and pressure sensors for increased reliability and safety.